Home / Child abuse. / Israel / Jews / Settlers / Terrorism / United Nations / Zionism / WATCH: Israel arresting children younger than 7 years old ... Why are all the Humanitarian organizations silent? WATCH: Israel arresting children younger than 7 years old ... Why are all the Humanitarian organizations silent? ABC an Australian news channel have also conducted a full investigation about these incidents as it was not easy to believe from the Palestinian media sources but what have been found by the ABC news agents was shocking. Some videos were also taken by some European activists who keep going to the west bank to help lighten the occupation and oppression of the Israelis over the Palestinians.. below we'll show you some of these videos .. Please share for awareness. Another video of Jewish settlers protected by the Israeli occupation army raiding on some villages in west bank where they intend to kick Palestinians out of their house in order to prepare the village to become another stolen land as a Jewish settlement. 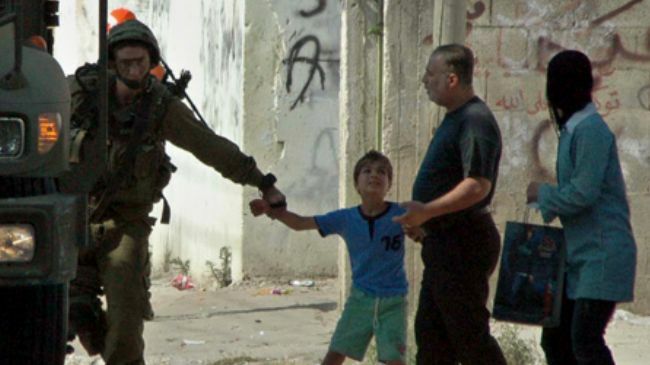 A third video shows two Israeli Occupation soldiers arresting a child as he's going home from school. two English activists chased them and asked them why they were arresting the child as he did absolutely nothing..
Watch and share this link. Note: We will continuously be adding videos to this post so please make sure you often visit this page as it'll be updated.